The ‘Los Angeles in Focus’ panel at 2019’s Connect Los Angeles event was moderated by Colliers International’s Cody Cannon. The conversation focused on what local leaders think about the state of the Greater Los Angeles markets, and what is happening in office, industrial, retail, multifamily and healthcare leasing and investment. More than 500 attended the fifth annual conference March 21st at the Hotel Indigo in DTLA. 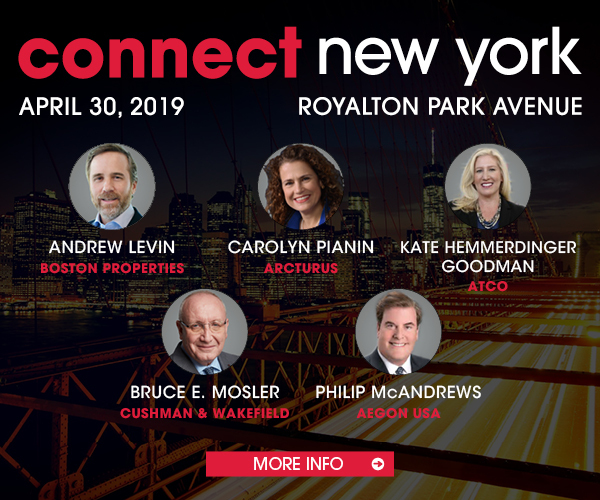 In addition to five deep dive panel discussions, there were three special presentations, capped by a salute over cocktails to the latest winners of Connect Media’s Top Broker and Women in Real Estate Awards. CBRE’s Barbara Perrier initiated the panel conversation, noting that the Los Angeles commercial real estate markets are “extremely healthy,” especially the industrial sector in which she works. “I’ve been doing this for 30 years and I’ve never seen the fundamentals quite so strong,” she says, noting that vacancies are at what could be considered unhealthy low levels because it is making it difficult for tenants to move around. JLL’s Dana Brody pointed out the lack of multifamily housing in Los Angeles, as development is not keeping pace with demand. She noted that roughly 100,000 units are needed over the next five years. That’s leading to a housing crisis and as a result of economy’s strength, rent increases of 3% to 4% are being allowed, even in some rent-controlled markets. Greystone & Co., Inc.’s Lee Harris agreed that the affordable housing challenge has not escaped the capital side. The last report he saw showed a shortage of 600,000 units in L.A., which he called “staggering.” That’s causing capital to flow to workforce housing from the agency side, and it is causing the sector to boom. Harris also pointed out on the finance side the competition is steep with plenty of capital “chasing deals.” Banks and others are active in the market, with agencies competing for deals on the borrower and financing side. Cannon says he sees a historic amount of capital on the sidelines allocated for commercial real estate investment. When coupled with low interest rates, it has created opportunities to invest and that favors a similar trajectory continuing over the next 12-24 months, he believes. John Hancock Real Estate’s Parker Jones says on the office side it was a good year for leasing in Greater Los Angeles. The market registered a 14% vacancy, net absorption of 500,000 square feet with an “exceptional” Q4 2018 and 3.4 million square feet under construction, which he called “staggering.” A telling statistic is the average asking lease rate that has increased roughly 7% in a year, notes Jones. Among the biggest challenges Los Angeles faces are entitlements, which Related’s Takano says is holding up much needed projects. JLL’s Brody agreed, though noted Los Angeles’ Transit Oriented Communities (TOC) rules are helping to expedite housing development and push projects along faster. Though in the industrial sector, an issue CBRE’s Perrier pointed out, is available land to build better quality developments. Cannon says a couple of interesting trends have emerged in Los Angeles that have not typically been part of the market dynamic. One is the growth of FAANG companies (Facebook, Amazon, Apple, Netflix and Google) taking down large chucks of space in the 500,000-square-foot+ range in the past 12 months, which he says is significant. The other trend is the repurposing of historic buildings or new development in DTLA’s Arts District. Brody says those trends are driving where people want to live, too. That demand in dense urban areas is largely being driven by Millennials, a group that accounts for 37% of the residents in in DTLA and 31% in Hollywood. “It is really interesting that’s where the jobs are taking them and where they want to live, too,” she says. For the industrial segment, Perrier notes it is interesting to see all segments of the industrial market in SoCal attracting attention. There’s demand from investors for big box space, traditional bulk space, business parks or “last-mile” opportunities, as well as investors seeking to do new development or pursuing value add plays. “We see money in all the buckets,” she says, pointing out there’s more capital than there are deals. Canada was one of the largest contributors to the industrial growth, with 2018 a record year for this group. Investors from Singapore were also active. She sees activity coming from both institutional and private capital. Perrier believes the impact of e-commerce growth could be a bit underestimated. She points out it is a major factor that will require the industry to figure out what retail and industrial will look like in the future. “It is the biggest driver in our industry today,” she says, with 40% of all transactions in L.A. County attributed to e-commerce deals and it has become the largest tenant occupier. On the Los Angeles apartment front, Brody notes an interesting trend emerging is a mid-level category she calls accessible units, which is a big segment that sits between affordable housing and market rate product. These plays typically involve the renovation of older B-type product into something similar to new construction, but at a 25% or 30% discount. This product makes units more accessible for a larger majority of people. She sees a lot of room there to play, since there’s so many buildings that could be renovated. On the 12 to 24-month horizon, Harris doesn’t sees a big change in the climate coming. He envisioned there’d be a slowdown in 2018, yet it mirrored 2017 from an investment perspective. That has him “cautiously optimistic” that 2019 will remain about the same, though there could be a slowdown coming in 2020, albeit not at the same degree as 2008. Cannon added that the engines of globalization and the tech sector seem to set up a continued bright future. He says those factors make it easy to argue that it is a totally different economy than it was 10 years ago. The economy is more complex, diverse and tied to an international base, that barring a major geopolitical disaster, he sees a “clear runway the next 12 to 24 months” based on the job and economic growth internationally, as well as the diverse economy.